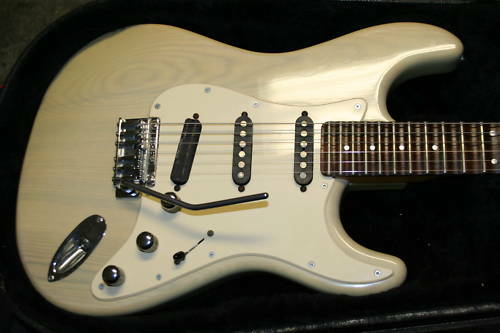 Here's a rare Schecter YM-1 Yngwie Malmsteen signature model on eBay. Both Schecter and Aria Guitars were quick to sign up Yngwie when he landed in the US in the early 80's and started making a name for himself as rock guitar's new wunderkind. Both endorsements were short-lived however, and Yngwie continued to play his Fender Stratocasters exclusively, right up until the time when Fender decided it made good commercial sense to produce an Yngwie signature model themselves. The Schecter YM-1 featured an ash body, fully scalloped rosewood fretboard and a two-point fulcrum-style bridge, likely made by Trev Wilkinson. Ash-bodied Schecters from this era are noticeably heavy -- think 80's era Les Paul-type weight in a Strat-shaped body! The Schecter YM-1 is also the very first example of a production model guitar with a scalloped fingerboard and is probably one of the reasons so few were made. 1986 was pre-CNC, and scalloping fingerboards was still an arduous, time-consuming, blister-inducing affair. Electronically, the YM-1 takes the cake! Since Yngwie never used the middle pickup on his Strats, the middle pickup on the YM-1 is wired as a hum- cancelling coil for the front and bridge pickups while the 3-way selector switch allowed for classic out-phase Strat tones in the middle position. The single-coils on this axe bear former Schecter employee Tom Anderson's large-polepiece, cover-less bobbin design. Also unique are the three control knobs on the YM-1 which are wired for master volume, treble and bass! Just under 5 hours to go on this auction! And here's a link to a rare Fender Yngwie Malmsteen Double Neck Stratocaster! No matter what Schecter Guitars are premium hand made guitars! I bought a YM-1 new, in the same "translucent butterscotch" you see above, but the neck has a maple fingerboard. I say "has", because I still have the guitar. It was a poorly built piece of overpriced junk. The nut was too tall and had to be cut down, the neck didn't fit right and needed the pocket re-worked, and bloody heck is it heavy! I traded a '79 Les Paul (plus cash), so I was mighty stupid as a teenager. I will say that the staggered tuners are a nice feature. And the scalloping is nice to have. But had I known Fender was going to come out with their own Yngwie model a couple of years later, I would've skipped this boat anchor and waited for the real deal. I've had a couple of Fender Yngwie's and they're far superior guitars. Except for the pickups. I put a set of EMG DG-20's in one, and it rocked. I do recall that the early Schecter models were remarkably heavy! They must have been made from the same stockpile of ash wood that Fender used for their guitar bodies in the late 70's and early 80's. Does anybody know how much this guitar went for at auction?